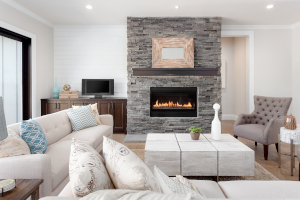 In part one of this blog, we talked about the things you will need to consider if you are installing a propane fireplace from scratch. But what if you have a masonry fireplace already in place? In that case, you will need to convert your fireplace by installing a propane fire log set or propane fireplace insert. Why convert your wood-burning fireplace to propane? Convenience – With a propane fireplace, you’ll never have to gather wood or sweep ash again. Just flip a switch and you’ll get instant fireside glow. Efficiency – Most of the heat a wood fire produces escapes through the flu. Propane fireplaces, on the other hand, are 80 percent efficient or more – which means more of your money will go toward heating your room. Safety – With propane, there are no more embers or sparks that can catch fire on carpet or varnished wood floors – or fire-causing creosote gathering in your chimney. Just take proper precautions for propane safety and you’ll be good to go. Option 1: A propane fireplace insert is a sealed combustion box that fits inside your masonry fireplace and vents through your chimney. Modern fireplace inserts can be extremely realistic, and they’re available in a number of sizes and finishes to match just about any décor. Installing a propane fireplace insert takes about a day. Option 2: A propane gas log set includes a burner and ceramic or concrete logs. While they’re not quite as realistic as a fireplace insert, they are an excellent value at about half the cost of an insert. They’re available in a variety of “woods,” so you customize the look to create your dream hearth. Not sure which way to go with your propane fireplace feature? We can help. Contact our propane hearth specialists or visit one of our Connecticut showrooms today to learn more. Get all the benefits of a roaring fire with none of the hassles or mess. Contact us today for a FREE estimate on a propane fireplace insert or propane gas log set for your Connecticut home!